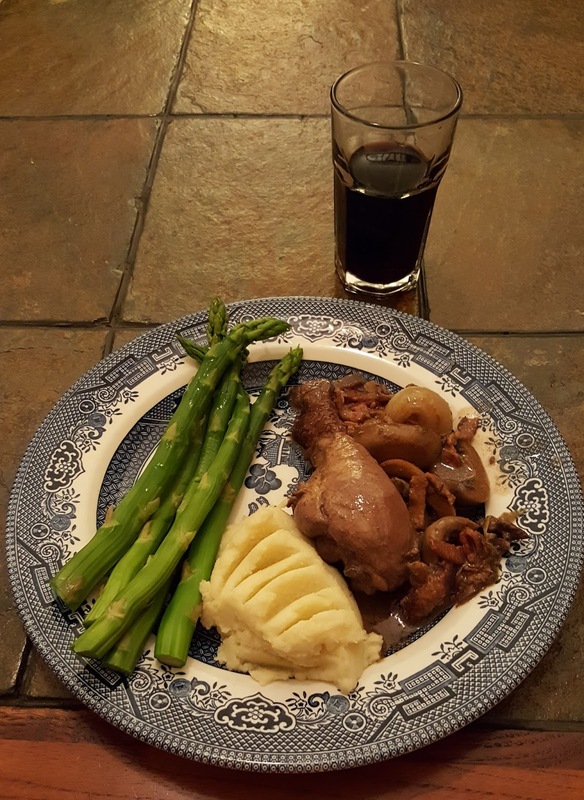 The day before you intend to cook the coq, make a marinade by first pouring the red wine into a medium size saucepan. Peel the onion, carrots, and the 3 to 5 cloves of garlic. Roughly chop the onion, celery, carrots and garlic, and add them to the wine in the pan. Add the peppercorns to the pan. Bring the marinade mixture to a boil and simmer it for 5 minutes. Allow the marinade to cool, then add 30 ml (or 2 tablespoons) of olive oil. 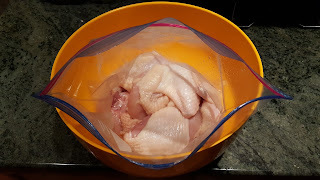 Meanwhile, cut the chicken into sections: wings, drumsticks, thighs, and breast pieces. The breast pieces can be boneless or with ribs still attached. 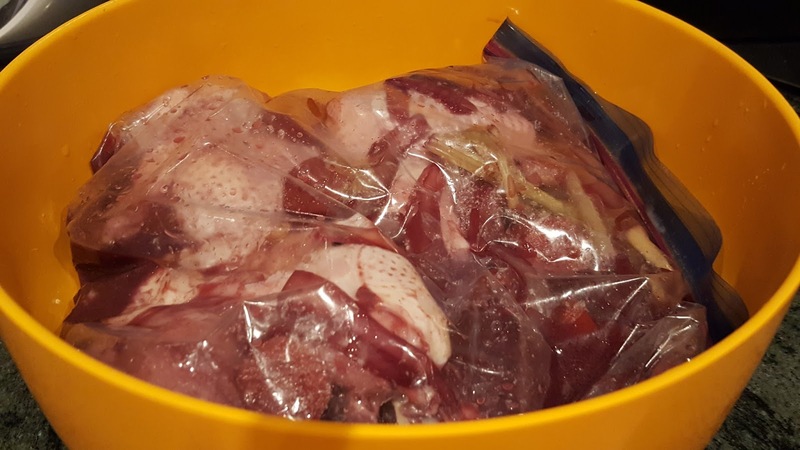 Place the marinating chicken into the refrigerator for at least 24 hours. 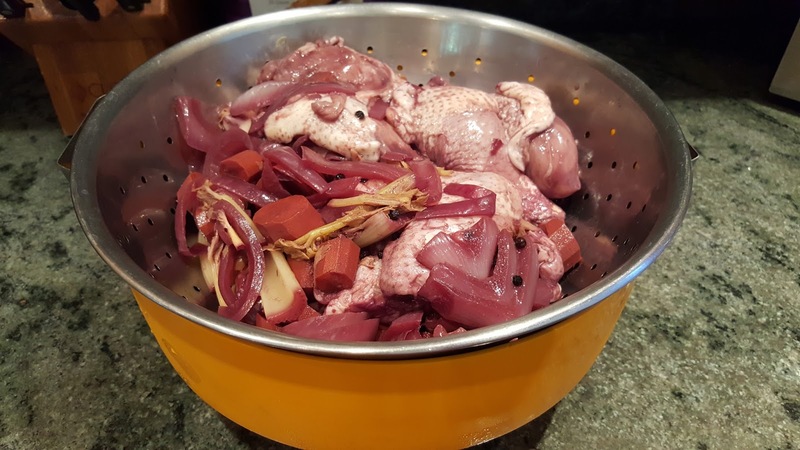 About 2 hours before you plan to eat, take the chicken out of the refrigerator and, using a colander or large sieve, strain off the liquid part of the marinade into a bowl. Pick out the chicken pieces and place them on a rack or paper towels to drain and dry and reserve the marinade vegetables. Cut the bacon into thin slices across the grain. 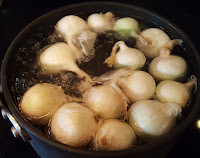 Finely slice the shallots and the 2 to 3 cloves of garlic. Pour enough oil into the bottom part of the pressure cooker to lightly coat it, and turn the heat to medium-high. Add the bacon bits and stir them almost constantly until they render most of their fat and turn golden brown. Remove the bacon bits from the pressure cooker and set them aside. Pour off most of the rendered fat. Replace the pressure cooker on the burner over medium-high heat, and place the chicken pieces, skin-side down in the pan. Brown the chicken pieces on both sides. Add the marinade vegetables into the pan and stir to brown them slightly. Add the marinade liquid into the pan and stir to deglaze the bottom of the pressure cooker. Add the shallots, garlic, thyme, parsley, bay leaves, and chicken broth and give a quick stir to distribute them evenly throughout. Following manufacturer's instructions, cover the pressure cooker and cook the chicken at high pressure (100 kPa, or 15 psi) for 5 minutes. Allow the pressure to recede gradually. Meanwhile, place the garbanzo bean flour into a small bowl and add enough water to make a thin slurry. Allow it to sit while continuing with the following steps. Plunge the boiling onions into a pot of boiling water for about 30 seconds, then drain them. When they are cool enough to handle, cut off the tops and bottoms, and remove their outer skins. Wash the mushrooms and, if they are large, cut them into bite-size pieces. In a large skillet, melt the butter in an equal amount of olive oil over medium-high heat. Add the mushrooms and turn them constantly until they absorb the oil. 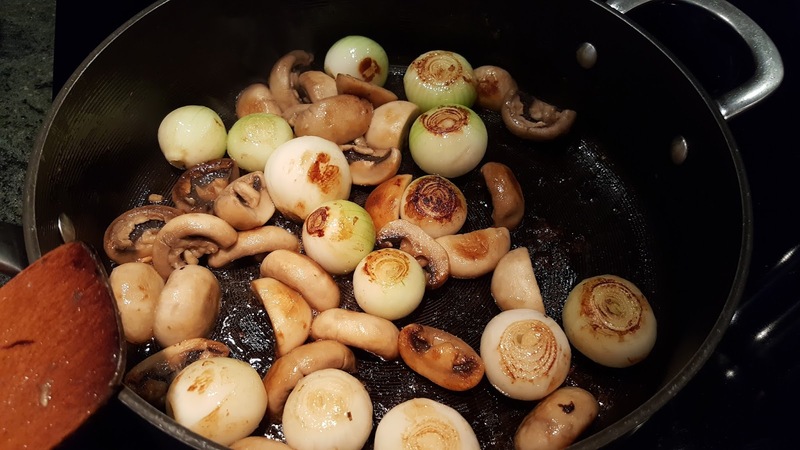 When the mushrooms begin to render back the oil, add the onions and brown them with the mushrooms, then turn off the heat. Open the pressure cooker and remove the chicken pieces into a serving dish. 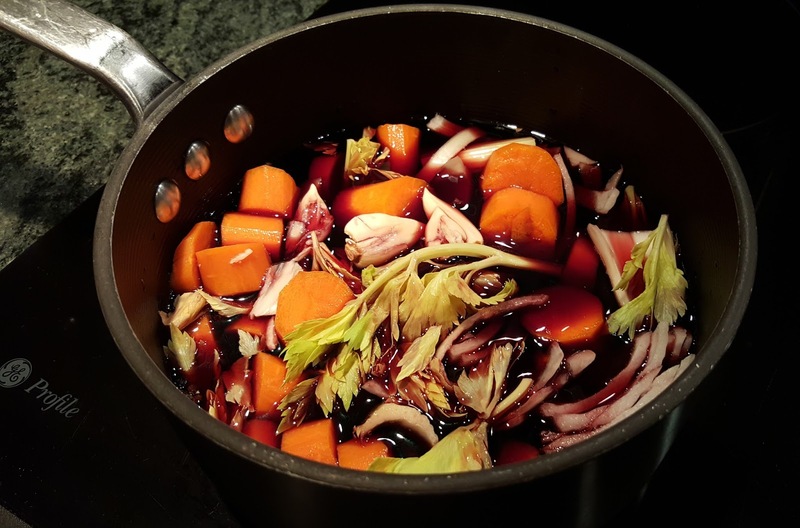 Using a slotted spoon, remove and discard all of the vegetables and herbs from the cooking liquid. Add the reserved garbanzo bean paste to the cooking liquid, place the mixture back on the burner on high heat, and stir until it thickens slightly. Add the reserved bacon bits, mushrooms, and boiling onions to the cooking mixture. Following manufacturer's instructions, cover the pressure cooker and cook them at high pressure (100 kPa, or 15 psi) for 5 minutes. Following the manufacturer's instructions, bring the pressure back to normal rapidly. Pour the contents of the pressure cooker over the chicken pieces. 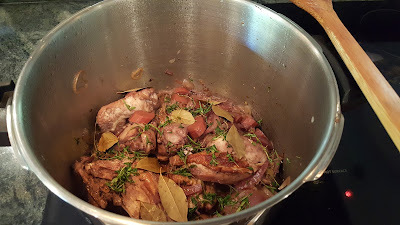 The basis for this method is a recipe for "Classic Coq Au Vin" on the epicurious.com web site. The pressure cooker saves braising time (but not, alas, prep time), while maintaining the deep, rich, goodness of this classic dish.